Waiter Jobs and Waitress jobs are the mostly demanded Jobs in UAE. 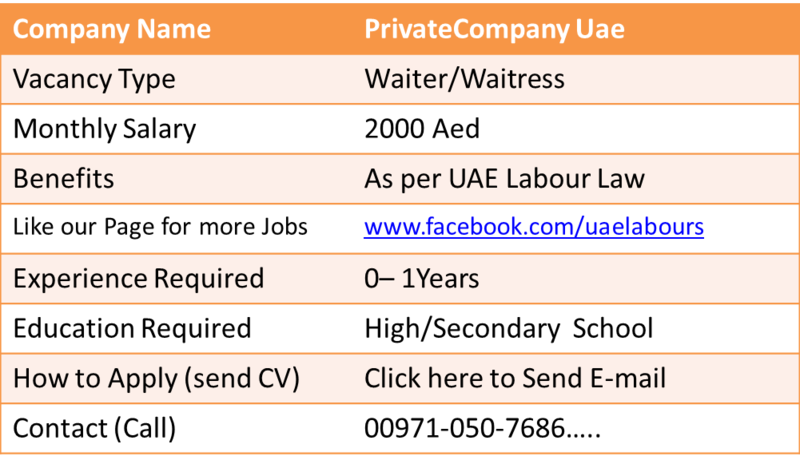 A Famous Restaurant in Dubai is appointing Waiters and Waitresses for Dubai UAE. Applicant should be presentable personality. Candidates should be proficient and dynamic in hospitality sector. Should be good looking and team player. Can work under pressure. 1) Should be Fluent in English. Should be Hard Working. 2) Should have ATTESTED GOOD CONDUCT CERTIFICATE or/ SHOULD HAVE ALREADY WORKED IN UAE BEFORE (on CANCELLED STATUS) as per UAE new regulation. Walk In Interview on Sunday 4th March 3:00 p.m. - 4:30 p.m. Address for Walk in Interview - Business Bay , Executive Towers , Bay Avenue Mall , Pls come to the FOOD COURT. Candidate should be with High/Secondary School Certificate. He/she have to join immediately. Job Location: Company is located in - Business Bay , Executive Towers , Bay Avenue Mall , Pls come to the FOOD COURT, Dubai, UAE. If you have the skills and experience which is required for Waiter or Waitress position, please forward your resume to below Email Address, or through provided Contact Number Shortlisted Candidates will receive confirmation email. Call : Mobile: 00971 – 050 – 7686266. Call only when you reach to Interview Location.